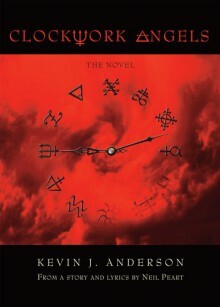 A remarkable collaboration that is unprecedented in its scope and realization, this exquisitely wrought novel represents an artistic project between the bestselling science fiction author Kevin J. Anderson and the multiplatinum rock band Rush. The newest album by Rush, Clockwork Angels, sets forth a story in Neil Peart’s lyrics that has been expanded by him and Anderson into this epic novel. In a young man’s quest to follow his dreams, he is caught between the grandiose forces of order and chaos. He travels across a lavish and colorful world of steampunk and alchemy with lost cities, pirates, anarchists, exotic carnivals, and a rigid Watchmaker who imposes precision on every aspect of daily life. The mind-bending story is complemented with rich paintings by the five-time Juno Award winner for Best Album Design, Hugh Syme.